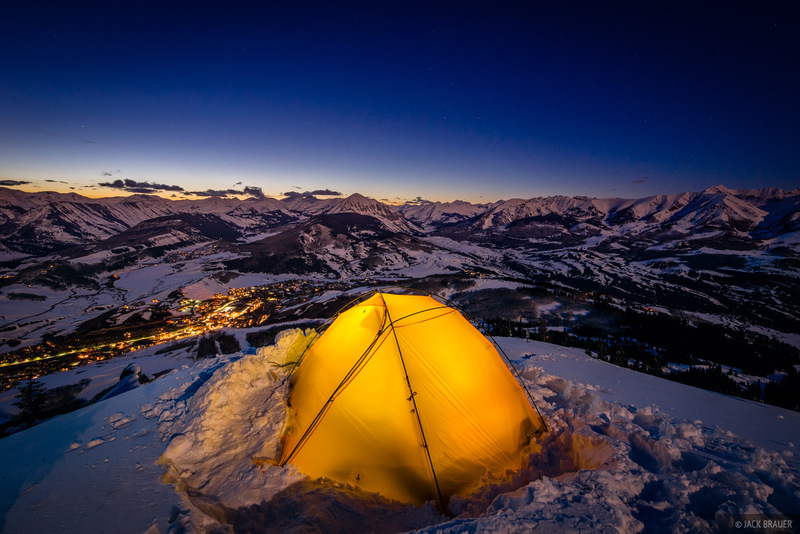 Winter camp at dusk above the town of Mount Crested Butte, with moonrise light illuminating the Ruby Range and Elk Mountains – April. Lately I’ve been itching for a camping adventure but have been too busy to do anything too ambitious or far away. Since we live across the street from Mt. 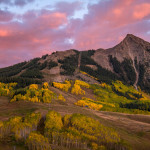 Crested Butte, yesterday I figured what the hell, I might as well just skin up the ski slopes and camp up there for a night! It wasn’t exactly a wilderness experience (I could actually see our condo down below), but it was still nice to spend a quiet evening under the moonlight gazing at the mountains. Posted in Backpacking & Trekking, Colorado and tagged Colorado, Crested Butte, Elk Mountains on April 21, 2016 April 21, 2016 by Jack Brauer. ← Previous: "A Taste of Haines"
Jack, another great shot! I know the feeling, you just have to get outside! Looks like you got a new tent?? Did you take this shot with your sony camera?? Thanks Kiim. Yes, this is my new Big Sky International: Chinook tent. Really like it so far; it’s sturdy enough for winter camping, and light enough and comfortable enough for year round use. And yes this shot was with the Sony A7R + Canon 17mm TS-E.
Yep, pretty sweet shot, Jack. Have you enjoyed your first winter in CB? Miss Ouray at all? Beautiful shot. Thanks Justin! 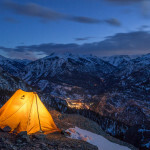 I’ve enjoyed it here so far, though I do miss Ouray and the San Juans pretty acutely from time to time… the plethora of backcountry riding to be had there, and my friends. Can’t complain too much though; CB is also a great place to be… and my wife is super stoked to be here so if she’s happy, I’m happy. 😉 I didn’t have many winter adventures here this winter, but I did manage to get 40+ days (well, mornings mostly) on the board! Yes I did get the snow flaps, which give lots of extra anchoring stability in snowy conditions. I had two guy lines on the far side of the tent (where the wind was coming from). You can see one on the left side if you look closely. It was quite windy during the afternoon as the storm was blowing out, and the tent had no problem. Structurally the tent seems bomber, but it is build with lightweight fabric so I suppose there is the potential that it could tear in super heavy wind. But that’s the comprise for a lighter tent; if I absolutely needed a hurricane-proof tent I’d opt for a [significantly heavier] Hilleberg. 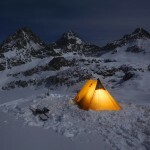 I still had some frozen condensation but I believe that is inevitable in frozen conditions regardless of the tent. That said, since this is a double wall tent, it was far better and more comfortable than my previous single wall winter tents; the condensation is mostly on the inside of the outer rainfly, with very minimal frozen condensation on the inside tent. Overall this is the lightest double-wall 4-season tent on the market as far as I know, which is why I bought it! I’m certainly pleased with it after this trip. Yes, I’m still happy with my photo setup! As for the San Juans vs. CB, it’s not so much about the vertical; it’s just that the San Juans have a lot more easily accessible backcountry. There’s some amazing stuff around CB, but much of it is further out there and more difficult to access without a snowmobile. Jack, thanks for all the info!! I did not know that your new tent was a double wall!! Only 4 +lbs incredible. With your description i am going to buy one. I guess the CB area does not have a million dollar highway going thru the middle of it like the san juans do!! You guys are having a fantastic ski year, i saw telluride is still getting snow, gotta love the mountains. I am getting ready to test the new pentax full frame out, it should be a winner. 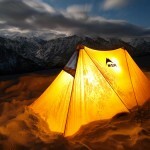 I think that’s your best glowing tent shot ever, which is saying a lot. Surreal.